Heading into his second full season racing 410 Sprintcars in Australia, expat New Zealander Brett Sullivan has a big 2018-19 season ahead of him, having committed to contesting the full Ultimate Sprintcar Championship SA schedule, amongst other selected race meetings. Following what was an encouraging first full season which saw him contest a limited schedule of 10 race meetings, with the 25-year-old racer taking a break mid-season due to the birth of his daughter Rylee, Sullivan became more and more competitive throughout the season as he familiarised himself with the Australian style of racing, also participating in the driving school at Toowoomba’s Hi-Tec Oils Speedway (Qld) with Robbie Farr at the beginning of the season. Once again planning to contest selected Eureka Garages & Sheds Series rounds and the Easter Trail over in Victoria, along with the Ultimate Sprintcar Championship SA at Murray Bridge Speedway totalling approximately 24 race meetings, Sullivan’s 2018-19 season will be bolstered by the addition of experienced crew chief Michael Armstrong, who will fly over from his home in Perth, Western Australia to support Sullivan. “The depth of competition in Australia is incredible and the format is quite different from New Zealand with time trials, so having Michael (Armstrong) in our corner as our crew chief is going to be a massive help at the track,” commented Sullivan, who has always previously raced a Maxim car back home in New Zealand but in Australia pilots a Cool Chassis, purchased from fellow expat Kiwi John Cooley, who is based in Warrnambool, Victoria. It was clear from a young age that Sullivan was destined to be a motorsport racer, with his dad Steve having raced Midgets throughout the 1980s and ‘90s for prominent car owner Lyndon Kendall at Western Springs Speedway in Auckland on the North Island. Making his start as a driver in go karts on the tar circuits, where he collected numerous New Zealand Titles, Sullivan later made the move to Formula Ford, where he was a consistent front runner, becoming a South Island Champion. It was during a test drive on a speedway dirt track for the first time with a Sprintcar provided by Jason Scott that he immediately became hooked on the class, purchasing a Maxim car and then going on to race for five seasons, which were highlighted by a runner-up finish in the overall 2015-16 season War of the Wings point standings. 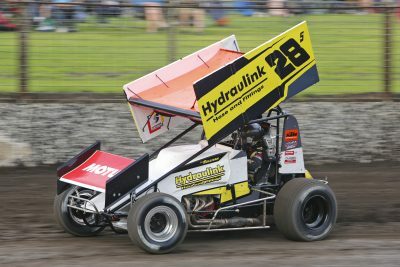 Originally from the South Island city of Nelson in New Zealand, Sullivan began sporadically travelling to Australia during the 2016-17 season, when he piloted a Sprintcar owned by Allan Woods for a couple of race meetings in Queensland, while also continuing to race his own car back in his home country. Making the decision to cross the Tasman on a full-time basis and move to the mining town of Roxby Downs in South Australia with his partner Kayla in early 2017 to continue his work as a fitter and turner, Sullivan purchased a HP powered Cool car, along with an immaculate transporter to complement the team. While his dad Steve, who still lives in New Zealand and regularly flies to Australia to support his son, had previously raced the team’s second car, he has recently decided to step away from driver duties to assist Sullivan at the track at each race meeting. Sullivan’s 2018-19 season campaign is set to get underway on October 13 with the opening Ultimate Sprintcar Championship SA round at Murray Bridge Speedway. Sullivan would like to thank the following 2018-19 season sponsors: Hydraulink, Gates Hoses, Motul Oils, Aimex Ltd, and Sable Clothing. Special thanks go to his dad Steve and his pit crew Cody, who both fly over from New Zealand for each race meeting, his partner Kayla for all of the work she puts in and support she provides, and Michael Armstrong. To find out more about Sullivan and his team, LIKE them on Facebook by searching Sullivan Racing Sprintcar Team or FOLLOW them on Instagram by searching @sullivan_racing.